and scroll to the section titled "Research Connecting DPP-4 and Cancer." 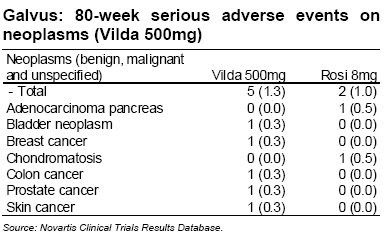 An investment analyst recently sent me a report prepared by his firm which explored the question of whether more news about Januvia's link to cancer might have an impact on the value of the stock of a competing drug firm. The report cited Dr. Goldstein's letter to Annals of Internal Medicine, which analyzed the cancer statistics from the Phase III testing used to gain FDA approval for Januvia, and then added some new data taken from post-approval studies. Here, taken from the investment company's report, is a chart of data presented by Januvia-maker Merck which summarizes two years of data from clinical trials as reported at the ADA 2007 conference. The category that includes cancers here does not distinguish benign growths from cancers, but the text of the report points out that in fact are not broken out by type here, but in the Phase III data only one tumor out of 19 was benign. And in that study as Dr. Goldstein has explained there were 10 more cancers per thousand in the Januvia group than in the placebo group. That makes one suspect that the reason that the benign and cancerous growths were lumped together in one category is to obscure the fact that there were more cancerous growths found in this study. 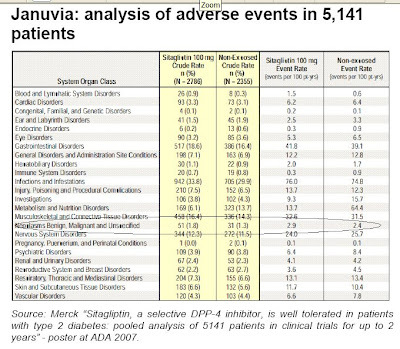 Here you see that there were 4 additional cases of Colon cancer in the Januvia group, and none in the placebo group. Colon cancer is one of the cancers that Dr. Goldstein pointed out have been linked to DPP-4 inhibition in previous research. European data from an 18 month study of Galvus, another DPP-4 inhibitor that has not been approved in the U.S. but is approved for use in Europe found similar hints of a slight increase in the specific cancers that the research Dr. Goldstein flags says are those most likely to be promoted by inhibiting DDP-4. These are not huge numbers of cancers, though for the people who got them, they were extremely significant. But when looking at this cancer data you must keep in mind that two years is a very short time in which to follow cancer incidence. A tiny but significant difference in cancer incidence at two years might well turn into a dramatic difference at ten years--if someone was to track the incidence of cancers in people taking these DPP-4 inhibiting drugs. But given the way that aftermarketing studies have been shown to destroy the profitability of top drug, as they did for Avandia, we aren't likely to see such studies. And because doctors are completely unaware of the linkage between Januvia and cancers it is very unlikely that they will report melanomas, prostate cancers, and colon cancers to the FDA as side effects of Januvia. It is far more likely that these unnecessary deaths will go unnoticed. After all, doctors have already been told that people with Type 2 diabetes are more likely to develop cancer. New data from Merck about Januvia was released at this week's EASD conference. You can read summaries of five studies about Januvia presented at EASD from this Merck Press Release. Note that the only side effects cited are those that occurred at a rate of 3% or higher--in at least 3 out of 100 people taking the drug. But the rate of additional cancers that we saw in earlier reports were below that threshold. Still, assuming that the incidence difference attributable to Januvia remains at the same rate as seen in earlier studies, For every 1000 people taking Januvia, an additional 9 would contract a potentially fatal cancer. But this statistic only becomes meaningful when you factor in how many people are actually taking Januvia. A Sept 4, 2008 press release from Decision Resources reports that "44 percent and 48 percent of surveyed endocrinologists and primary care physicians, respectively, expect to increase their first-line prescriptions for Januvia and 35 percent and 33 percent of surveyed endocrinologists and primary care physicians, respectively, expect to increase their second-line use of Januvia between 2008 and 2010." And the Merck Press Release about the EASD presentations bragged that "More than six million total prescriptions for JANUVIA have been dispensed worldwide since launch. JANUVIA has received approval in 80 countries and is available in every region around the world." So if 6 million people are taking Januvia, what does that 9 extra cases of cancer per thousand translate into? 54,000 people! 54,000 people who developed colon cancer, prostate cancer, ovarian cancer or melanoma because the DPP-4 which their body would have used to fight these cancers was turned off. That's a LOT of people. Especially when you realize that it only took evidence that it had caused 155 unnecessary deaths to get Rezulin taken off the market. And if you are one of those 54,000 people whose life is cut tragically short, it won't matter much to you that the incidence of this side effect does not rise to the 2% or 3% needed to get it included in the reports that doctors see. The data presented at EASD showed that Januvia does lower blood sugar. But another study also showed that Byetta lowers it better. 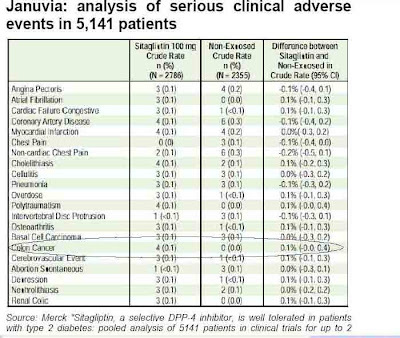 The recent bad press for Byetta linked it to 6 cases of pancreatitis, however it did not show that the rate of pancreatitis in the huge group of people taking Byetta was higher than that of the diabetic population at large. The Januvia data does compare cancer incidence in people not taking Januvia with those who were taking it, and that gives it far more credibility to my mind. So I continue to believe that if you want to see what raising GLP-1 levels will do for your blood sugar, Byetta is a much safer alternative. Januvia raises GLP-1 by turning off DPP-4, the enzyme responsible for eliminating naturally produced GLP-1. Byetta is synthetic GLP-1 designed so that it sticks around longer than the natural stuff. With Byetta you are not messing with an enzyme (DPP-4) used throughout the body for many other, non-blood sugar related uses--like killing cells that have recently become cancerous. And if you or a loved one do develop a cancer while taking Januvia make sure to tell your doctor about the research linking DPP-4 inhibition to cancer that Dr. Goldstein cited in his letter to Annals of Internal Medicine. And then report your case to the FDA yourself, because that is the only way that the FDA is going to learn about cancers linked to Januvia. I hope you will never get cancer, but sadly, given the solid research connecting DPP-4 inhibition with the promotion of cancer and the very early data emerging from these very short clinical trials of Januvia, it looks like a lot of people with diabetes who are having this drug heavily promoted to them will. I have little doubt that the reason that benign and cancerous growths were combined into a single category was to obscure the fact that there were more cancerous growths found in the study. The pharmaceutical industry have become real masters at obfuscating data in their clinical trial results, and they tend to extend that beyond their NDA/ANDAs to pseudo-publishing as a co-author of a medical journal entry, while somehow, negative information always seems to be lost or never makes it to a journal publication. The only way this is going to change are some radical reforms to the FDA, and in particular, the way we fund this agency. As Dr. Marcia Angell, a senior lecturer at Harvard Medical School wrote in an editorial to The Boston Globe, the user-fee act which was implemented in 1992 under Newt Gingrich's leadership in Congress, essentially put a fox in charge of guarding the hen-house. But in an era where money is tight in Congress, it may be tough to come up with the money needed to vanquish the current system. This is getting to look a tad disturbing< I hadn't realised how much Januvia had taken off as a first line drug. There's little doubt that Byetta works well for the people it works well for, but there's a population for which it doesn't work well or at all. I would assume Januvia would show a similar effect in action BUT inhibiting DPP-4 affects a lot of systems other than GLP-1 and GIP, so not only are some people going to get benefits AND problems, a subset of patients will be getting the problems with NO benefits. Oh for a truly independent means of testing the effects of meds. We have NICE here in the UK but their primary function is cost control which doesn't make them any more credible than the drug companies' propaganda departments.